One of the most exciting and gifted talents to emerge from the world of fencing has been American teenager Rebbeca Ward who became both the first American and the youngest ever world champion when she lifted the sabre crown at just 16-years-old in 2006 in Italy. 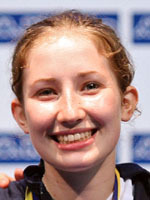 The petite (1m53) fencer who hails from the northern west coast of the US will be the odds on favourite to win Olympic gold and set the unique record of becoming the first fencer to hold the cadet, junior and senior world titles at the same time in 2006. Briefly ranked number one in the world, the Oregon native was also the first American to win the sabre world title and won the World Cup title to boot after a sparkling campaign in 2006-07. It has been a swift rise to the top for Ward who was already winning national and junior World Cup titles at 15, the year in which she also incredibly finished 7th at the senior world championships and helped win the team event in Leipzig, Germany. Then came her breakthrough season in 2006 defeating her compatriot and the Olympic champion no less in Mariel Zagunis 15-11 in the final. Zagunis who became the first American fencer to win an Olympic title in 100 years when she won in Athens also shares the same coach, Ed Korfanty, as Ward and the two ladies compete at the same Oregon club, the Oregon fencing alliance at Beaverton. However, despite her golden success of 2006, the following season at the world championships in St Petersburg she could only reach the last-32 but was philosophic in defeat saying: "It was just a bad day and it will give me extra motivation to bounce back". She also added that the Olympic gold in Beijing is her driving force and currently her main objective. "We are working very hard for that (Beijing), more than in previous years," she confessed. With Ward and Zagunis challenging for the women's Olympic title, the chances of an all-American final loom large if the two girls can avoid each other in the draw.